Most Effective Ab Workout? 2 Minutes or 1000 reps? The 6 pack abs, or a “washboard stomach”, seems to be the holy grail for the average non-athlete. For athletes, especially sprinters with above average muscle mass and below average body fat, a six-pack (or even 8-pack) appears to come with the territory. We don’t train for 6-pack abs. It just comes naturally. But we want fast times! So that doesn’t mean we don’t do countless abs and core work. I believe you need to have SOME core work that covers all the angles and rotations in sprinting. So this article is a continuation of Isometrics and Ab Core Exercises – The Hidden Secret and Core Muscle Training: How much is Enough? So how much core work is enough? 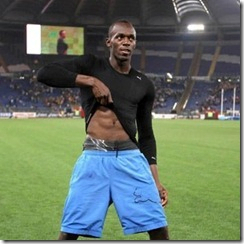 This is a famous picture of Usain Bolt at the 2011 Rome Diamond League. I am surprised he did a pre-victory lap before starting his warm up. But he won anyways… Just barely. Charlie Francis recommended 1000 reps on the easy days, and 500 on the hard days. 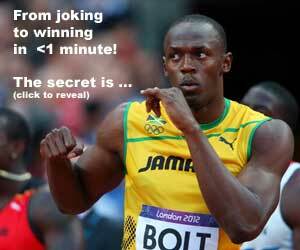 Hmm, do the math, and that’s 3×1000 and 3×500 equals 4500 reps in a week! My aim is usually 500 reps 4 days a week, or about 2000 weekly reps, plus a couple of isometric planks. I feel that’s enough! Before you gasp in horror, 500 reps in a day isn’t that much because it’s 10 sets of 50 reps. That includes crunches, chin-knees, toe touches with med ball, med ball throwing side to side with a partner, spider crawls, and so on. If we are indoors, yes, we will use a Swiss or physio ball, and take advantage of the med balls. So what does 2000 abs a week look like? On the left is a picture of me, taken in my first meet in M40. I’ll update with a new picture for M50 in 2 years, which is pretty much the same except a few more gray hairs. 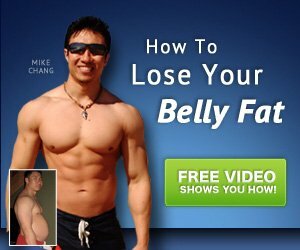 I added a watermark to the picture, as I’m afraid to have scrapers stealing my photo for a Mike Chang Fat Loss product! But how much ab work is enough? When you think of Basketball, with all that jumping 48 minutes a game several times a week, is it really necessary to do vertical jump training?? Their legs are already trashed. So the question is: How much ab work is enough for someone who trains 30 hours a week? In 10 different events? Below is a video of Trey Hardee’s 2 minute Ab routine, courtesy of AthleticsWeekly.com. Great article Jimson, but what about abs endurance workout (like 10×50 reps of different exercices) vs. abs strentgh or power workout (like sets of 10 to 15 reps of hard abs exercices that includes weight and medball throws) ? Most recently my successful ab exercises have been hanging straight leg raises (3 x 20-40) and hanging knee raises w/ a 15 lb dumbell between the knees( 3 x 20) along with side hyperextentions. I personally think the best ab/core routine is the one that demands you to work hard and one you cant B.S. when you’re by yourself not to mention changing it up every 4- weeks. However one that I’ve made up that does WONDERS for your abs along with leaving you in a fetal position afterwards (its a good pain…I promise) are what I call inverted situps/crunches w/ or w/o twists or a med ball (variation – the spice of life). FIRST, dont do this if you believe you have a weak lower back and honestly consider talking to a doctor first. Basically if you have access to an inversion table and can invert yourself 180 degrees with no pain try to slowly crunch your way to touching your knees and over time progress to touching your toes. You can add a twist w/ the crunch trying to reach the outside of your hips or after you gain the strength twist all the way up to small/pinky toe with the opposite hand (left hand – right pinky toe and vice versa). In my opinion if you can do 3 x 20-30 of the full situps w/ or w/o twists add a med ball and watch the abs start popping out! What does it mean successful exercises – did they helped you to run faster, jumping higher, lifting more, feeling better, etc.!? Regarding the article’s subject – nothing is certitude (or lasts forever). It doesn’t exist and permanent already made formula. What’s working for you now, will work less over few months or years. It is a continuous process of “research”/ findings and adaptation. I know people who never did a crunch in their life and they got a very nice 6/8packs design, as well as I know people who are working out all day long and their 6 packs look quiet poor, even if they are not overweighted… at least 30% of Jamaican beach boys have Bolt’s abs and the only crunches they are doing are while loving their girls :))… or picking up a plant’s leafs :)) . It exists a different criteria that might help people deciding (isometric or dynamic work-out – I don’t know why do they have to decide, and not doing both…still…)… let’s say that the “crunch” (as we are performing it) is not a natural exercise – in “normal” conditions there are not many gestures and/or movements similar to it. Isometric is more close to the abs natural function – posture and fixation. So…I do not know which one is better for 6PX, but I’d rather advise gymnasts, dancers, climbers, etc. performing both (and probably it’s one of the very few cases when the overdose is not the worst thing to be done) but dynamic work-out it is extremely important. Football/hockey/rugby-players, bobsleighers etc. (including hammer-throwers) giving priority to isometrics but working both… Paddling and rowing are the best examples which pleads for the both forms… To gym visitors (even workers) to stay on isometrics. What does it mean successful exercises – did they helped you to run faster, jumping higher, lifting more, feeling better, etc.!? In mine opinion are more questions: what for, what exercise, how and how long/many, etc. Isn’t the “6-pack” more about diet than any exercise? Everyone has the muscles, large or small/strong or weak, they are just covered in varying amounts of skin and body fat. Obviously for efficiency we want to carry as little excess weight while running as possible so lower body fat assists us in being faster runners, so having a six pack just shows we are not carrying extra weight around the track nothing else. Having a strong core is something completely different.